Everything could’ve been so much different for Clarets full back Stephen Ward. The 30-year-old’s career switched paths in a matter of seconds during the summer of 2014 as he was on the brink of signing on the dotted line and sealing a move to Brighton. The Republic of Ireland international, fresh from a season-long loan spell with the Seagulls, was in East Sussex ahead of talks with former boss Sami Hyppia until the Clarets came calling. That one conversation, offering the opportunity of Premier League football, enticed Ward in to making a sudden U-turn and the rest, as the saying goes, is history. 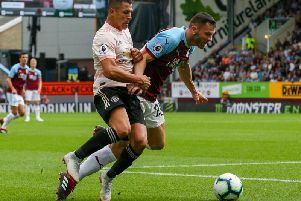 The full back, who went on to make his debut in the Capital One Cup loss to Sheffield Wednesday at Turf Moor, said: “I was (close to signing). They’d been speaking with Wolves a lot last summer but Burnley came in at the last minute and I couldn’t turn down the opportunity to have a shot at the Premier League again. “Logistically it was a lot easier for me to move here and I knew a lot of the boys. If it hadn’t have happened I probably would’ve signed and I’d have been a Brighton player and been happy signing there. But Burnley came in and that’s fantastic. “I was down there and I got the call last minute and that was it. Sometimes things happen in football and you’ve got to go with your heart and my heart said come here, have a crack at the Premier League and join a club that was really on the up. It was nothing against Brighton, it was just one of those things. Ward scored four times in 44 appearances in the Championship for Brighton as they reached the play-offs. However, the Seagulls were denied a trip to Wembley as they were beaten 6-2 on aggregate by Derby County. “I really enjoyed my year there and I’ll only ever have positive things to say about the club because it’s a fantastic set up with fantastic people,” Ward said, who is expecting a vibrant atmosphere on his return to the AMEX Stadium. “I really enjoyed it but I’m a Burnley player now and my priority is to go down there and perform. It is a good club and I enjoyed my time there. “It’s a fantastic set up and they get good crowds throughout the season. When I was there we were getting 20,000-25,000 every week. It’s a well supported club and I’m sure they’ll try and make it as tough for us as possible. Meanwhile, with the squad reunited after the international break, Ward says Sean Dyche’s squad will look to build on the mood that a 15-game unbeaten run has formulated. With eight games of the season remaining, Ward said: “It’s a big game (against Brighton) but it’s as big as any other game that we’ve got. There’s eight massive games left. The first one is Brighton away and we won’t look any further than that. He added: “There’s a great mood; we’re scoring goals and playing decent football. The best thing about it, though, is that we don’t get carried away.